Two journos, three kids, and a four-wheel drive. Sign up with your email address and we'll let you know when we've posted something new. It started with Tim Bailey's weather report. Heavy winter rains were once again filling Lake Eyre. The salt pan was surrendering to the relentless creep of that rarest of desert phenomena - standing water. When flooding Queensland storms drained into Lake Eyre in 2011, it had been dry for a generation. “We should take the kids,” I enthused to Mary that night. “They'll be middle aged before they get the chance again.” The open fire was glowing nicely in the grate at home in suburban Sydney. Suddenly a camp fire filled our vision. Three weeks later the winter school holidays were upon us. I wangled a week from work. Mary, between teaching criminology and doing freelance TV production, cleared her schedule. The plan was set. We had a car at least theoretically capable of the journey. A few months earlier we had bought a 15 year old Nissan Patrol on a whim. It had 230,000kms on the clock and it cost $10,000. It looked honest enough. We enrolled on a four-wheel-drive training course in the NSW Southern Tablelands through the NSW & ACT Nissan Patrol Club. Seasoned eyes examined our purchase. They pronounced themselves satisfied subject to another $8000 spent bomb-proofing the three-litre diesel and buying extra gear. It still cost less than a new Toyota Corolla and stirred slightly more entertaining dreams. The enemy was time. The challenges were not merely the outback, but the ability of three kids under ten (10, 7 and four to be precise) to weather a journey of more than 2500kms in less than 10 days. In the end we did 4500kms and the kids were great. Mary set off early, taking the two little ones and all our gear the 1200 kilometres to Broken Hill. She broke it up over three days - giving the kids a chance to visit the Western Plains zoo in Dubbo. On Saturday, the first day of my break, I flew into Broken Hill with ten year old Coco. It was my first visit to the Silver City. Tailings dumps - mountains of gravel and dirt - dominated the town. The glowering skyline is the legacy of enormous effort extracting the mineral wealth that launched the world’s biggest diversified mining enterprise, BHP Billiton. The main street was broad and dominated by stolid late Victorian architecture. The street names reflect the purpose of the place: Argent, Iodide, Bromide, Mica. But the roads seemed too wide for the busted looking houses and abandoned stores that kept watch over traffic-less intersections. “How much for that place, d’ya think?” I asked Helen, the cabbie who brought us from the airport to the Hilltop Motor Inn. I looked at it appraisingly. Like the handsomest of houses in Broken Hill, its exterior walls were built from random lumps of stone, glued together with thick white mortar rendered pink by the fine dust carried on the restless outback breeze. “Been a long time since you could get a house in Sydney for $135,000,” I said. She glanced sideways at me to gauge my interest. Helen was a large woman who looked about 50, form fitted into a sagging Ford Falcon. I felt an urge to give her the money, buy her house, lay a cheque on her dashboard, make it happen. I did not have a spare $100k but her dream seemed so reasonable and so long-delayed it seemed un-Australian not to buy into it. I’d like to think Helen gets her ambition. Or that she is in fact the richest woman in Broken Hill, routinely lifting fat sums from visiting dupes with her winsome tale of frustrated wanderlust. Perhaps she spends her downtime jetting between palaces in Hawaii and the Cote d’Azur. Coco and I filled our day with a long wander through the Broken Hill Regional Art Gallery, replete with Streetons and Nolans and the finalists from the Outback Art competition. 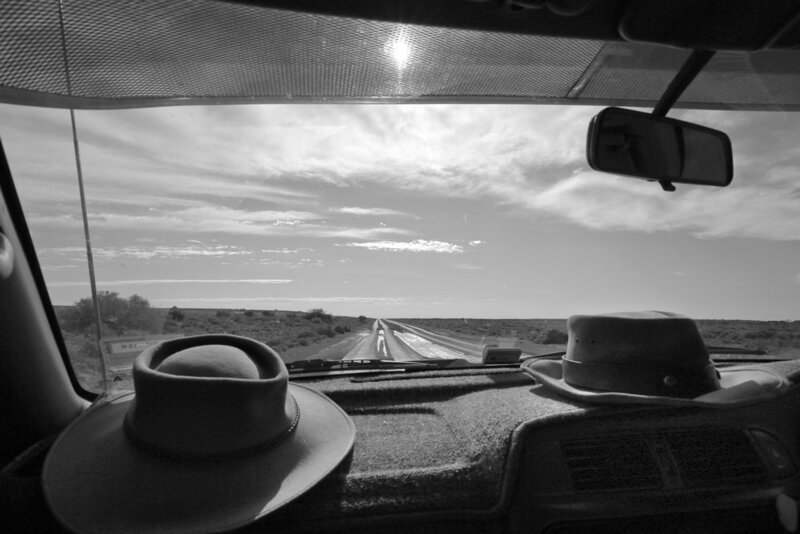 Beyond the town limits stretched the aching distances of Outback Australia. Inside the cool and spacious old Victorian building were the efforts of so many to interpret and respond to that epic space. We followed up with a massive, greasy lunch on the main street and the solemn purchase of some suitably "bush" shirts. Mary rolled in that evening. The kids were happy. Mary was happy. The car had survived. we climbed back on board and drove the 30-odd kms to Silverton, backdrop for almost every outback apocalyptic movie ever made. As the fat sun settled, cattle trotted in across the red earth. Dusk brought a cold wind. We chowed down at the Silverton pub with a lusty fire working in the grate. The stars were crackling in a clear sky as we bundled back into the truck and headed back to Broken Hill. Over the next couple of days, we drove about 1000kms. First, we took the Barrier Highway south-west to Peterborough, then due north through increasingly sparse towns on the western edge of the Flinders Ranges. At Leigh Creek, a Scotsman called Scotty took us in well after dark and rented us a miners’ cabin. He had everything required for bush life, a beard that had taken over his face, and a decrepit old mongrel called Foxy Lady. Leigh Creek also had, to my surprise, a doctor, a senior specialist who enjoyed spending part of his year rotating through various remote area clinics. It was a handy find because Coco had developed conjunctivitis that the doc was able to treat. By now, two things had struck us. One, was that the kids were happy. Four year old Holly and seven year old Jacob shared the row of seats behind us. Their thrones were set in sleeping bags and camping mattresses, soft toys and the rapidly accumulating detritus of the road. Ten year old Coco was in a single seat right at the back, surrounded by all the serious clutter that we couldn't strap onto the roof rack. None of them were strictly comfortable but their capacity for invention was impressive. Coco created games that had them in constant giggles. Animals in fields, or increasingly appearing wild in fenceless country were greeted by a range of soft toys. Imagined conversations would then follow at considerable length. We had been spotting emus since just outside Broken Hill. Goats, kangaroos, eagles and other exotica were added to the sheep and cows who themselves were a delight to Holly. Holly also reported that she spotted a seal and a reindeer. Nor was the driving boring. There’s an old notion that campfires are “bush television.” People sit around it, staring happily into the flames as if they were a TV drama. Conversation is about the state of the fire, its warmth, its need for more wood and where best it might be placed. Time passes companionably. Driving long distances is much the same. The scenery changes, noteworthy things emerge. Sometimes moments of great beauty are laid out with simple power. Driving for hours in city traffic would not generally improve a marriage. Journeying across a land both empty and filled with interest, did. They longer we traveled, the better we liked it. And each other. And we liked each other before we started. On the second day out of Broken Hill, we drove into Marree. We were in dirt road country, at the launching point to the Birdsville and Oodnadatta Track, with the third in the triumvirate, the Strzelecki Track, starting just to the south and running north east to Innamincka more than 450 kilometres away. I was past caring whether we actually saw water in Lake Eyre by this point but the mission was the mission and after coffee and a feast of home-made bakery delights at the tin shed Marree general store, we headed off up the Oodnadatta Track. Within a couple of kilometres, we took the turnoff to Muloorina station, a sprawling 4000 square kilometre cattle concern on land where in summer even lizards struggle to survive. Recent rains had left the clay-based track a little slippery but the road was good for the first 50 kms. This took us to one of those wonders of Central Australia - a genuine oasis. In a sudden dip from the treeless plain was a reed-fringed billabong hundreds of metres long though only 20 wide. “Swans!” bellowed Jacob, and indeed there were. Three adults and a cygnet, making regal procession over the greenish pond. A brolga stood, impressive in its height, at the western end. Bright green budgerigars flitted in the river gums. There was shade and one other camper. But we had other plans. Powering on over a corrugated track, our ambition was to see Lake Eyre. The Lake is in fact, two lakes - Lake Eyre North and Lake Eyre South, linked by a narrow watercourse called the Goyder Channel. Our Hema map showed a spot called The Neck at the northern end of this channel, marked with a little green tent to indicate a campsite. And there we headed. The track was through low scrub on a base of white sand. Purple flowers and little yellow daisies gave flashes of colour, encouraged by the recent rains. Emus and kangaroos appeared. A dingo, sleek and well fed, tracked across our path. The sky was huge and blue and scored with fillets of high cloud. The sun, westering now, thickened the light and brought an early hint of the evening’s gold. Suddenly a low grey plain, free of all feature, opened to the west. This was the uppermost section of Lake Eyre South. A rough track led down to the shore. We took it, but there was no sign of water and it was not our destination. Rather than risk getting bogged, we returned to the path and continued north. It was only a few more kms when the track ended at a little fenced circle with warnings against camping. We scrambled up a dune, and there was Lake Eyre. Sunlight gleamed off the brilliant silvery edge of water, too sharp and material to be a mirage. Salt-encrusted clay flatlands stretched towards that shore. And there we played, until the approaching night made us retrace our steps to Muloorina to set up a tent and a campfire in the dusk.